CHILLIWACK, B.C. - B.C. 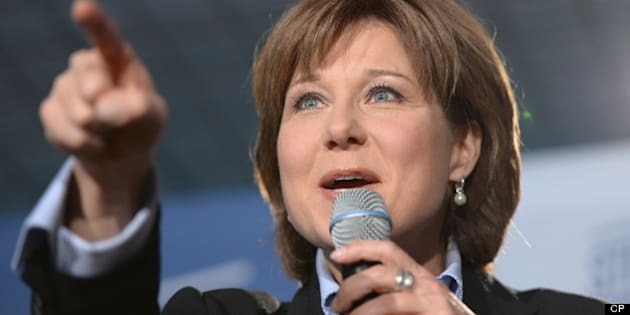 Liberal Leader Christy Clark was on the road Wednesday, trying to shore up support for her trailing party in bellwether ridings and to brand this election as a choice between her jobs plan and a "tax-and-spend" NDP. Clark said the campaign promises of her New Democrat rival Adrian Dix are already adding up. "The NDP have just promised to spend in the last two days another billion dollars," Clark said during a campaign stop at a concrete plant in Chilliwack. The Chilliwack-Hope riding had been a traditional Liberal stronghold, but the New Democrats won a byelection a year ago with 42 per cent of the votes. The Conservative candidate John Martin and Liberal candidate Laurie Throness split the centre-right vote, capturing 25 per cent and 32 per cent. "The message they sent was 'Hey, you guys right-of-centre, free enterprisers, you guys get your act together because if you don't unite the free-enterprise coalition, come the election, we're in trouble,'" Martin said. This time around, Martin is back in the Liberal fold, and he said he's not alone. "A whole bunch of us have left the B.C. Conservatives — we've left it in droves, actually — and we're working within this big (Liberal) tent," said Martin, the Liberal candidate in the Chilliwack riding. Throness is the Liberal candidate in neighbouring Chilliwack-Hope. Martin said he went to the upstart provincial Conservative party led by former federal Tory cabinet minister John Cummins because he had concerns about the direction the B.C. Liberals were taking. "At the end of the day, the B.C. Conservatives never did, and they will not get off the ground," Martin said after touring the Langley Concrete plant with Clark and Throness. Cummins dismissed Martin's criticism. His team has been knocking on doors and working on the ground, "which is where a campaign is won, he said in an email. "We don't need the same resources to win as a party that's spent $100,000 in desperation on a glorified infomercial," he said, referring to Clark's paid television commercial that aired prior to the start of the campaign. Clark started off her day in Surrey, where she chatted with patrons at a mom-and-pop restaurant. In Merritt, dozens of supporters greeted Clark at a cafe in the riding held for years by New Democrat Harry Lali. About 250 supporters came out to a rally Wednesday night in Kamloops, a bellwether riding that has voted in a member of the governing party every election for more than a century. It's also a riding where Liberal Environment Minister Terry Lake, who won by about 500 votes in 2009, was the target of an unsuccessful anti-HST recall effort. Ranching, forestry and mining are the economic backbone of the Interior hub city, where Clark was taking her deficit-reduction and jobs plan pitch on Day 2 of the campaign. The economy is the focus, said Clark, who was optimistic despite consistently abysmal polling numbers. "I believe we can grow the number of seats we have, because the people in Chilliwack and the people in Merritt... want to grow the economy," Clark said outside Langley Concrete, a plant she said will be building infrastructure for the liquefied natural gas plants planned for northern B.C. "People in these communities understand how fragile the world economy is and I think they know there is real risk out there. That's the kind of change the NDP would bring to our province, it would certainly be change but it would be the wrong kind of change in a fragile economy." "I think people in these communities are keenly attuned to the risk inherent in raising taxes and growing government, and so that's why I'm visiting with folks here because I think it's a message people understand and I think it's a message that people live everyday as they struggle to get ahead." At the De Dutch restaurant in Surrey, Don and Dorothy Wilson met Clark as they ate their breakfast. Unlike most of the dozens of people who packed the restaurant, they are not party members and were not expecting the premier. The 74- and 68-year-olds, respectively, remain undecided but they will definitely cast ballots on May 14. "If you don't vote, you shouldn't complain," they say, finishing one another's sentences.